It's not always easy to save enough money to cover your retirement needs or the needs of your dependents once you’re gone. Having to retire early or suffering through poor investments can hinder savings efforts. That's why life insurance can be a good investment — even after you retire. Term life insurance can be a good fit if you think your children will be on their own, your house will be paid off, and you have enough money to provide for your loved ones. However, that scenario doesn’t apply to everyone. Some people may need permanent life insurance. There are many reasons you might need permanent life insurance during retirement. A permanent life insurance policy provides coverage for as long as you pay the premiums. It also has a benefit that term insurance does not — the capability to accumulate cash value on a tax-deferred basis. Cash values can be used for any purpose. Unlike loans from most financial institutions, you do not have to pass a credit check or other restrictions to use the money. If you don't repay it, your beneficiaries will receive a reduced death benefit. If you must stop paying premiums, you can use the cash value to continue your insurance protection with a lower death benefit. Dependents — If you're taking care of parents or a special needs relative, you need to ensure there's enough money to pay off the mortgage and other debts and to provide regular financial support. This is especially important if you work during retirement for additional income. Life insurance can provide that financial support to your dependents after you die. Spouse — Unfortunately, many people take so much out of their pension or retirement savings that nothing is left for the surviving spouse. 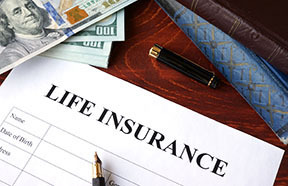 Life insurance can be used to replace retirement benefits. In addition, your spouse could live 10 to 30 years longer than you. If that happened, would your retirement money last that long? Final expenses — You might have enough retirement money saved for your dependents, but are your final expenses covered? Those expenses can include funeral costs and estate settlement costs, including estate and inheritance taxes. This is especially important if you have a large estate. Good rate of return — A permanent life insurance policy can give you a better rate of return than a certificate of deposit. It's a way to have some money invested at no risk. Illness —It's not pleasant to think about having a terminal illness, but it pays to plan for it. People often live 15 to 20 years longer than planned, and the possibility of having a lingering illness increases with age. It pays to have an accelerated death benefit rider added onto your policy. With this rider you can receive a lump sum portion of your death benefit to pay medical expenses if you become terminally ill or need to live in a nursing home. Create or Protect a Legacy — Your beneficiaries must pay taxes on inherited assets, including IRAs and tax-deferred annuities. Beneficiaries can use the death benefit to pay those taxes. Replace Employer Policy — After you retire from your job, your employer may cancel your employer-sponsored group life insurance plan coverage. To make sure you're not left with zero coverage, buy coverage now because it's cheaper when you're younger and have no health issues. Supplement Retirement Income — You might have enough cash value in a permanent life insurance policy to fund your retirement interests, such as starting a business, pursuing a hobby, or paying for an emergency. Remember that taking out the cash value reduces the death benefit, and you might have to pay taxes on the amount you withdraw. Favorite charity — You can name a charity as your beneficiary. Gifts to charities are tax deductible, so your gift will not be subject to estate taxes. Talk to your agent about how much money you'll need to meet the needs listed above. That amount will determine how much coverage you need. Am I too Old to Buy Insurance? You can still buy a policy in retirement, although the premiums will probably be higher than if you were much younger. Please contact us if you still have questions about whether life insurance is right for your situation.